The Galaxy 300 was the e first of the Galaxy Series. WRL, was a major supplier of amateur radio equipment from the 1950s through the 1970s. WRL was located in Council Bluffs, Iowa, and run by Leo Meyerson (W0GFQ). WRL manufactured some of its own products, under the Globe and Galaxy brand names. I was very fortunate to receive this old Boat Anchor for the price of asking. Thanks again Walt. As with most of these old rigs the first place to start your restoration is in the power supply. The Galaxy 300 has a very nice external supply that uses a hefty transformer and bridge rectifiers. No voltage doublers here. I first checked all of the electrolytic filter caps and as one can expect some indicated open. It's not unusal to find dried up filter caps in these old rigs. Once these filter caps were changed out it was time to gently apply some voltage and beleive it or not the supply came to life without a puff of smoke or popping of fuses. 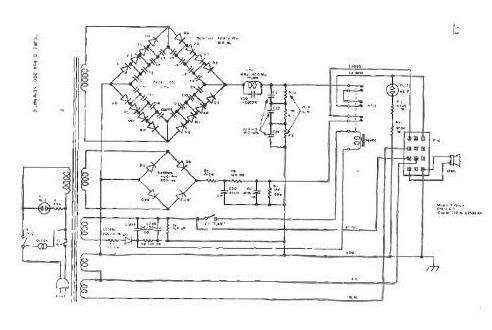 Below is a copy of the Power Supply Schematic. After a mechanical inspection of the transceiver, I decided to blow out the dust with compressed air and as you can see from the picture on the left the rig was pretty clean. The final tubes 6HF5s were melted and had seen better days. I had to research the possible causes of melt down before I installed a NOS set of expensive finals. I noticed that the rig used some very unusual tubes. These tubes are multisection compactrons made by GE. I was pleasantly surprised when the rig came to life after all these years. The TR relay needed a good cleaning and lub to make reliable contact and the IF stages needed a bit of a peaking tune up. Later after several hours on the air the rig developed a short and went dead. One of the disk bypass capacitors on the 300 VDC line shorted and had to be replaced. This old rig makes a nice "boat anchor" for your shack. It gets good audio reports and there seems to be a lot of interest in these Galaxy models. From an Ad in Feb 1963 CQ magazine. hertz; 6CL6 driver, pair 6HF5 finals; shipping weight 27 lbs. The rig was later reviewed in OCT 1963 QST and DEC 1963 CQ. Amateur Radio pioneer Leo Meyerson celebrated his 100th birthday on February 24 2011. Leo passed away this year (2012) at age 100 in Rancho Mirage, Calif. Leo was born in Council Bluffs, Iowa and he resided in Omaha, Nebraska. and Palm Springs, Calif.
Leo Meyerson was a renowned pioneer in the history of radio in the Midwest. He is known internationally for his contributions to Amateur Radio, and by the call sign W0GFQ. Galaxy Electronics was formed by Leo in 1962. It's primary amateur products were the Galaxy 300, Galaxy III, Galaxy V, and GT-550 single sideband transceivers. Galaxy was sold to the Hy-Gain Antenna Company in 1970. Leo retired in 1977. Leo' interest in wireless began in 1920.